It’s not all dry numbers and stuffed elephants. Scientist are commonly and often passionately enthralled by the beauty they find in their subject matter – not only the TV stars. Drawing has been, and continues to be, regarded as a valuable skill in biology: the camera has never fully replaced the pencil and paint brush. Modern floras and field guides commonly prefer drawings over photographs, despite the extra cost and time. This preference derives from the difference between the essence and the substance of a subject: the camera can faithfully record the substance but in a drawing a skilled illustrator can bring out the essence. Here art and science appear to share common philosophies. There is, in reality, no boundary between the scientific illustration and the artistic appreciation of a subject, but a hidden danger lurks if the artistic vision takes control of the scientific representation. Ernst Haeckel, whose work features extensively on this and other sites, was one of the greatest, if perhaps not the greatest scientific illustrators, fell prey to this. The classic maxim in biology that “Ontogeny Recapitulates Phylogeny” i.e. the embryo goes through steps during its development similar to the stages in evolution of the species has been widely taught in biology - this derived from Haeckel. There has been a long debate (see Haeckel’s embryos: fraud not proven ) over whether Haeckel illustrations of embryos was over-selective and biased - and even an apparent mythology (promoted by the fundamentalist Christian groups) of him being taken to the University Court in Jena by contemporary professors and tried and found guilty for fraud. Whereas Haeckel was undoubtedly a giant in the field of scientific illustration there are others whose contribution needs to be recognised and documented. I have a short list, which I’m aware is parochial and I would greatly welcome additional information on scientists from other nations. The biography below is part taken from upon the entry for Haeckel in Wikipedia , with supplementary information from Ernst Haeckel, Art Forms in from the Oceans , and Visions of Nature: The Art and Science of Ernst Haeckel by Olaf Breidbach, both books published by Prestel. A valuable and informed discussion of the context of his view and representation of nature is discussed in Lynn Gamwell’s book: Exploring the Invisible: Art, Science and the Spiritual. Ernst Haeckel (February 16, 1834 – August 9, 1919) was an eminent German biologist, naturalist, philosopher, physician, professor and artist, who discovered, described and named thousands of new species, and coined many terms in biology including anthropogeny ecology , phylum , phylogeny , and the kingdom Protista . Haeckel promoted and popularized Charles Darwin's work in Germany and developed the controversial recapitulation theory (" ontogeny recapitulates phylogeny ") claiming that an individual organism's biological development, or ontogeny , parallels and summarizes its species' entire evolutionary development, or phylogeny . Ernst Haeckel was born in Potsdam (then part of Prussia ). In 1852, Haeckel completed studies at Cathedral High School of Merseburg . Following this at his father’s encouragement Haeckel then went on to study medicine in Berlin and Würzburg . Haeckel attained a doctorate in medicine in 1857, and subsequently received a license to practice medicine. He apparent was not comfortable with the clinical side of medicine and turned to mainstream science. Haeckel studied under Karl Gegenbaur at the University of Jena for three years, earning a doctorate in zoology . This period of his life appears to be somewhat unsettled. He planned to go on an expedition with Gegenbaur, but the latter was unable to go. Funded by his father, in 1859 Haeckel set off for Messina. 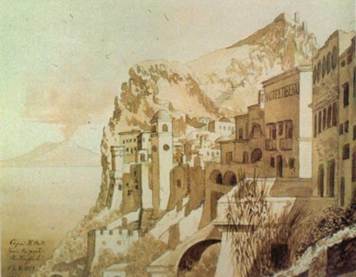 He commenced his fieldwork, in Naples, a major centre for marine studies. He planned to work on the anatomy of starfish and sea urchins but the supply of these organisms by the local fishermen was unsatisfactory. Haeckel became very disillusioned with science and turned to landscape painting – by chance meeting the artist Hermann Allermers. They travelled and worked together and in his own words was at the point of abandoning natural science for landscape painting. They had arrived at Messina when his father arrived and set him back on the path of science again. 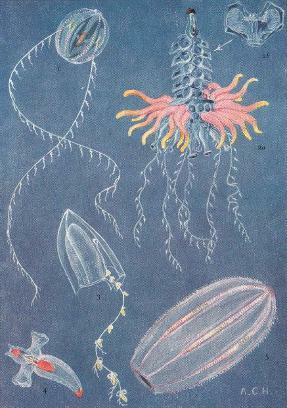 He spent 6 months doing systematic research on marine plankton, the Strait of Messina provided a wealth of material, particularly radiolarians. 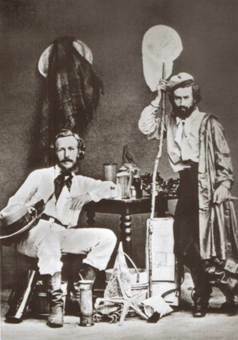 This was a turning point for Haeckel, who returned to science and to Germany with 12 crates of samples. This in essence was the starting point of Haeckel’s long and distinguished career. Gegenbaur encouraged Haeckel to habilitate, making himself available for, and in 1862 successfully being appointed as, professor of comparative anatomy at the University of Jena , where he remained for 47 years until he retired in 1909. Between 1859 and 1866, Haeckel worked on many invertebrate groups, including radiolarians , poriferans ( sponges ) and annelids (segmented worms). As product of his expedition to Messina, Haeckel named nearly 150 new species of radiolarians. From 1866 to 1867, Haeckel made an extended journey to the Canary Islands Hermann Fol and during this period met with Charles Darwin , in 1866 at Down House in Kent , Thomas Huxley and Charles Lyell . Over the period from 1859 to 1887 Haeckel named thousands of new species. In 1867, he married Agnes Huschke. Haeckel retired from teaching in 1909. Haeckel's wife, Agnes, died in 1915, and Haeckel became substantially more frail and died on August 9, 1919. The published artwork of Haeckel includes over 350 detailed, multi-colour illustrations of animals and sea creatures . 1) The full 100 plates, scanned from the 1904 edition of Kunstformen der Natur . The manuscript contains a hotchpotch of images, only those of plankton from are reproduced on this site. Images that have been cut or colour modified are presented separately. 2) The full text of Kunstformen der Natur is available on line this also contains the scanned images, although the quality is not as good as those in the Wikipedia collection. 4) Another rich source of Haeckel’s images and work are found is the reports of the Challenger Expedition: Report of the Scientific Results of the Voyage of H.M.S. Challenger - 1873-76 compiled by C. Wyville Thomson, and John Murray. An electronic edition has been prepared by Dr. David C. Bossard from original documents in the library holdings of Dartmouth College, Hanover New Hampshire. June, 2004. There is copyright held by David C. Bossard, I am unclear of the status relating to the figures. The text and images may also be found in the Biodiversity Heritage Library; however, to say the very least, the organisation leaves a great deal to be desired. The Plates are labelled as “Text” (no comment) and are in a JP2 format, which is not easy to read. Further, the Plates of Volume 18 (The Radiolaria) for some reason have been omitted and crop up elsewhere on the collection, and the images are of very poor quality – in brief “Abandon all hope ye who enter here” is my comment on the site. 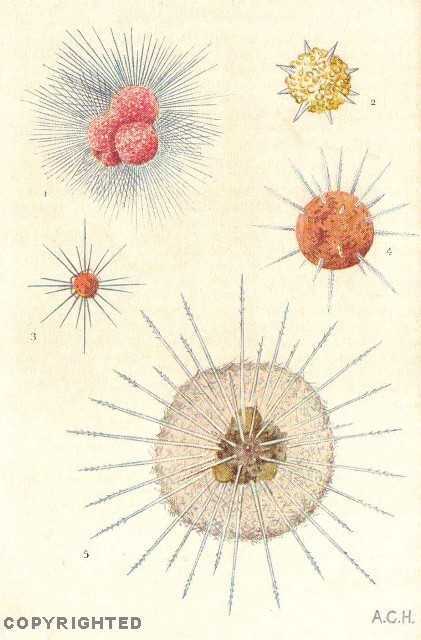 Haeckel prepared reports on four groups, links to the three planktonic groups are given below. Zoology Volume 4,Part 12, 1882, 154+20 pages with 32 plates. Zoology Volume 28, Part 77. 1888 , 380+8 pages with 50 plates and 7 woodcuts. In many respects Alister Hardy was a no less interesting man in his own way than Haeckel – fought in the First World War in the Lancashire Bicycle Brigade, knighted for his substantial work of fisheries and in his later years founded a the Religious Experience Centre (Religious Experience Research Centre - at which he and his co-researchers began to gather a unique archive of accounts of religious experience and to publish research into the area – much in the tradition of science. Interestingly he, as Haeckel, was also involved in a controversial evolutionary theory – in Hardy’s case it was the Aquatic Ape Hypothesis – in essence he argued that the direction of the hairs on the human body when swimming were in line with water flows over the body and was taken as supporting evidence for the hypothesis at apes have had a aquatic phase in their evolution. He made a massive contribution to the scientific study of fisheries and their food—the plankton. He was far ahead of his times in recognizing the need to gather oceanographic data on a continuous basis and his plankton recorder was the first oceanographic instrument to provide underway sampling. The Continuous Plankton Recorder survey was initiated from Hull by Hardy in 1931, since then nearly four million miles of the ocean has been surveyed, mainly by merchant ships, the traditional remuneration being a bottle of Scotch. The Sir Alister Hardy Foundation for Ocean Science (www.sahfos.ac.uk) was set up in Plymouth to honour and continue his pioneering work on the plankton. From 1925-27, he was chief biologist on the 'Discovery' Expedition to Antarctica. 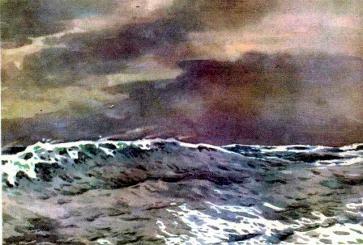 An account of this “cruise” is given in his book Great Waters (1967), beautifully illustrated with his water colours. On the return leg to South Africa, when passing through the roaring forties, Hardy wedged himself on the foredeck, with a jar of water hanging around his neck, to paint impressions of the great waves (doubtless wearing a 3 piece suit and tie). 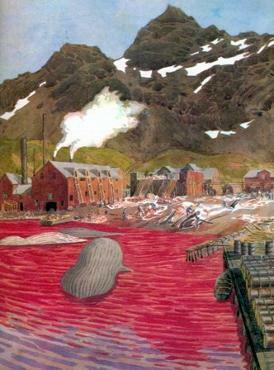 His painting of the whaling station at Gritviken is a harsh reminder of the brutality of that trade - one of the few coloured illustrations we have of the gruesome business of processing of whales at that station. Probably his one of his most significant contributions, certainly to the public awareness of science of the oceans are his two books in the Collins New Naturalist Series The Open Sea: the World of Plankton (published 1956) and the companion volume Fish and Fisheries (published 1959). The colour plates in the first of these volumes have been a curiosity and inspiration to many and part reason why some of us ended up as ocean scientists.